Lots of study programmes of “Learn Russian in the European Union” project include a broad range of excursions and field trips. On Saturdays we usually go on excursions to significant historical and cultural centres in our region such as Aglona, Rundale Palace, medieval castles in Sigulda, Riga, Jurmala, the capital of Lithuania Vilnius, etc. Participants of the project always go on this kind of trip together with the students of the Department of Slavic Languages of Daugavpils University, who are also involved in the project as peer communication partners. Our excursions are run in the context of learning Russian, in the atmosphere of informal communication when everyone takes part in the conversation, and there are no teachers or students. The trip to Aglona is one of the first excursions we go on. We go there with a guide – a professional historian and lecturer at Daugavpils University. So, today I would like to tell you more about this place. Aglona is a small settlement 40 km away from Daugavpils. Its history dates back to the 7th century. 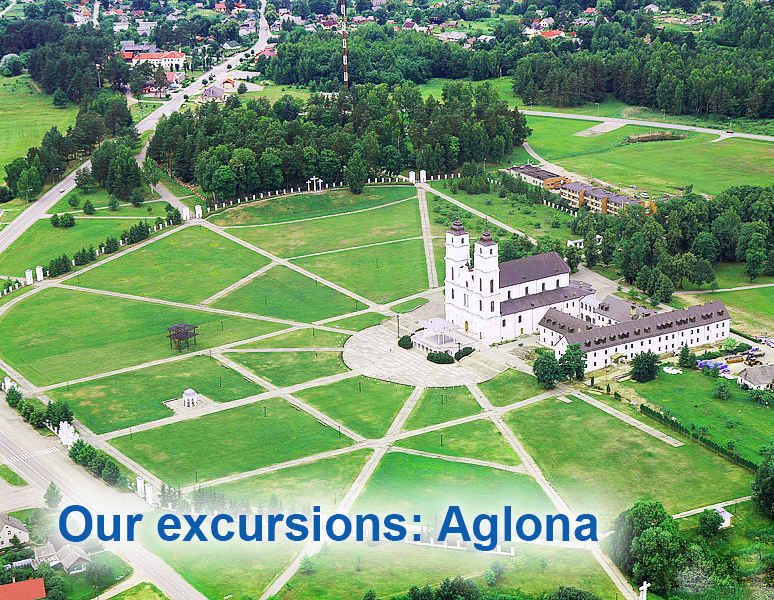 Aglona Basilica – the most significant religious centre in Latvia, and lots of other interesting sights are situated here. The population of Aglona is just about 1 thousand people. The life here is tranquil and slow but not at all boring. The history of basilica started at the end of the 17th century when the Dominican Order built a wooden church by request of local farmers. Later, in the second half of the 18th century the stone church in the baroque style and the complex of adjacent buildings were erected. The church in Aglona is the only one in Latvia that has the title of “Basilica minoris”. The Pope of Rome John Paul II gave it to the church in 1980 to celebrate the 200th anniversary of the church. 13 years later in 1993 the Pope visited the Basilica and ministered the service there. More than 380 thousand people from Latvia and other neighbouring states arrived at Aglona on this day. Every year, on August 15 the Basilica celebrates the day of the Assumption of the Virgin Mary into Heaven. It is one of the most important Catholic holidays. Hundreds of thousands of pilgrims gather at the Basilica on this day. They come from Latvia, Lithuania, Poland, Belarus, and Russia. However, pilgrims from other states come too. So far, the pilgrim from Spain made the longest way to the Basilica. One of the reasons why people worship this place is a unique 17th century icon. We know neither the artist who painted the icon, nor its history. It is said that before it appeared in Latvia, the icon stayed for some time in Poland, Lithuania, and the Vatican. The icon is carefully preserved in the Basilica and it is covered almost all the time. It is demonstrated to the general public only on the day of the Assumption of the Virgin Mary into Heaven. 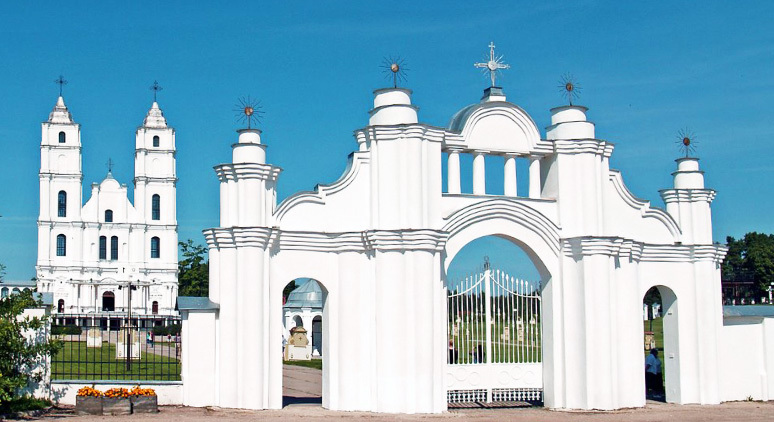 A legend related to the lake where the Basilica is located also attracts pilgrims. According to the legend, a peasant was taking his child to the church to get him baptised. When he was sailing across the lake, a storm started. Trying to balance the boat, the man did not see that the child had fallen aboard. When the man realised what had happened he cried to the Virgin Mary, and the child turned up not far from the bank where he was saved. Today, the Basilica is also visited by lots of tourists. From time to time it holds classical music concerts, organ concerts, and choir concerts. 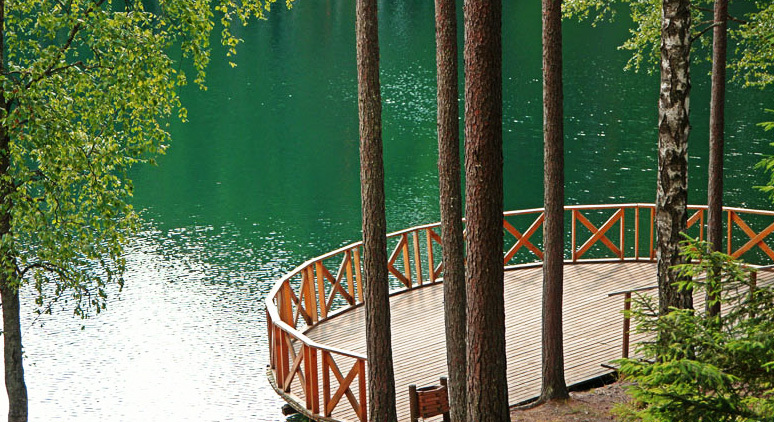 Cortok or Devil’s Lake is a small lake in the middle of the forest not far from Aglona. This place is also steeped in legends. There is almost neither fish nor plants in the lake. The water is extremely clean and transparent. There have never been any houses or settlements near the lake. People have always thought that the lake has no bottom, and that the devil himself lives there (this explains the name of the lake) and abducts young women. When the devil comes out of the lake the water boils. The origin of the lake is still not completely identified. One of the most known versions is that the lake is situated in a meteor crater. The exact depth of the lake is not known either, although the scientists say that it can reach up to several dozens of metres. The absence of flora and fauna can be explained by high radon concentration in the water. It is several times heavier that the air and freely soluble in water making it uninhabitable. Sometimes the accumulated gas goes up – this explains the legends about the “boiling water”. Cortok is the nature area protected by the state and it is included in the list of nature protected areas in Europe. But first of all, it is a really beautiful and lively place, excellent for any type of relaxation. Not far from the Basilica there is a small private museum. The owner of the museum is a collector Valdis Tumovs. As Valdis puts it, this is a museum of soldiers but not history as such. 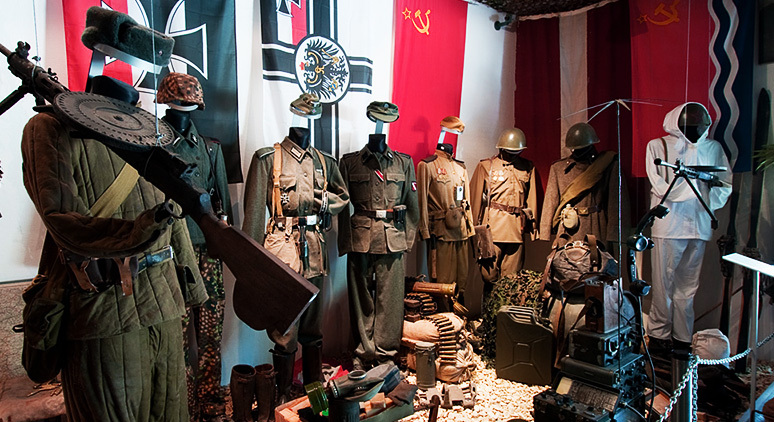 In the museum collection there are thousands of things: arms, uniforms, personal possessions, documents, etc. Valdis’s message is that there is a person standing behind every museum exhibit. The most valuable museum exhibits are the documents of Hitler’s secretary and the letters which subaltern-lieutenant August exchanged with his girlfriend Marta. The safe where the documents were kept was just a couple of metres from Hitler’s table in the Reich Chancellery. In 1945 the building was exploded and nobody knew what happened to the safe. But, as it turned out, it had not been destroyed. Some years ago, Valdis’s friend won the tender for the dismantling of the ruins of the building, and he found the safe with the documents. There are more than one thousand letters in the correspondence between August and Marta. This is a very rare and complete collection. There are even dried flowers and tree leaves which the lovers had sent to each other. You can touch a lot of museum exhibits: to try on a uniform, hold a gun, take a picture at an old German motorcycle, etc. The museum is attractive not only for history lovers. There is no group which has left the museum disappointed. There is one more place in Aglona which is to me extent related to religion. 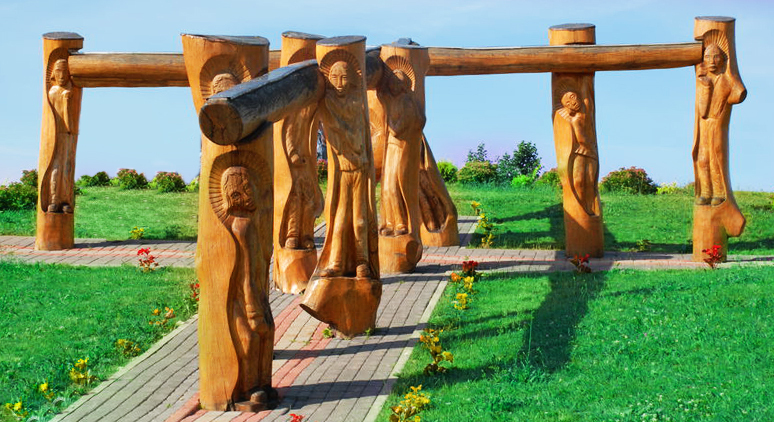 It is a huge park of wooden sculptures of the Bible scenes. All these sculptures were made by one man – Eriks Delpers. Eriks used to be a pilot. Once he missed an accident by a close shave. Therefore, he decided to create this park as a sign of gratitude to God. The official church does not recognise the park. Nevertheless, visitors from various states come to enjoy the wooden sculptures cut out from an old oak. Formidable wooden sculptures are really impressive. No matter the attitude of the official church towards this place, it’s hard not to admit that Eriks is a brilliant artist. When you look at his works you realise how much effort he invested in the creation of his sculptures. Aglona is an interesting and unique place which combines ancient legends, religion, history and tradition. Here you can see the main church in Latvia, the monument of the first king of Lithuania, the World War II museum, and the bread museum where you can enjoy authentic Latgalian bread. All these objects are surrounded by beautiful lakes and nature. Nikita Shiman. Peer communication partner. Historically relevant trips like the one to the WW2 museum in Aglona help bring Russian history closer to American students who never covered such topics in school. Nice! One more reason to visit Latvia!